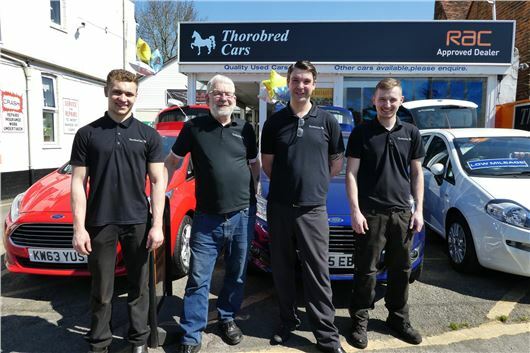 Thorobred cars has always been a family run garage, originally starting as a main dealer in 1975 and becoming independently run in 1998, taking with it vast knowledge and expertise. The garage at first looks like a small village dealership, however upon entering the premises there is an expansive work shop with state-of-the-art equipment extending into the back. Starting out as a main dealer, the garage won best customer care and service for Alfa Romeo main dealers four years running. For a time, they had a female-only sales team, a rare thing in those days, which gave the garage publicity in the local papers. The premises was built as a coachworks before the 1920s, as you can tell from the low beams towards the back of the garage. Thorobred cars has been a member of the RAC Approved Garage Network for 4 years, meaning the garage must maintain high standards with frequent inspections. If given a job, they will complete it to the highest possible standard. This garage isn’t one for a quick and cheap fix. In the past, the garage has taken on apprentices from local schools, helping give back to the local community. The owner, Lloyd, described his garage as “a friendly village garage that also sells cars”. The garage is willing to work on absolutely any car despite looking solely like an Alfa Romeo and Fiat specialist. When it comes to the car sales side of the business, Thorobred Cars will only sell cars in tip-top condition. The cars are always serviced and MoT’d by the garage and specialise in low mileage. The garage also has the equipment to perform diagnostic work, four-wheel alignment and bodywork- normally things out of reach for a small garage. Having been in business for 43 years, it looks to be staying in the family with Lloyd's father Clive still very much active and his son jack hopefully taking over in the future. The team always show customers parts after they are replaced and will allow customers back into the workshop to view the work being done. The garage also undertakes classic car restoration, restoring cars from the ground up. Normally the team have a project classic car for them to practice and pass on some of the older forgotten skills. The garage has two free courtesy cars and will also do local pick-ups and drop-offs. There is a waiting area with tea and coffee making facilities for those customers waiting for work to be done. People will travel miles to have their Alfas Romeo or Fiat models fixed, entrusting their prized cars to Lloyd and the team. Honesty and trust are a key part of Thorobred Car’s values. With reviews like “wouldn’t take my car anywhere else” and “a garage you can trust”, it’s easy to see why Thorobred Cars is ranked in the top three in the Surrey. Thorobred Cars is in Staines, Middlesex. Have you visited? Leave a review on the Good Garage Guide page.